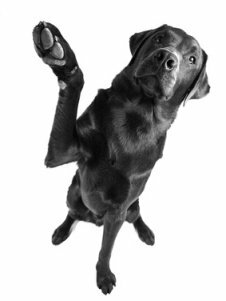 When we talk about the American Labrador Retriever we are referring to the breed standard as defined by the American Kennel Club (AKC). On this page we will have a look at the main tenets of the AKC standard. A really endearing nature of Labradors is their large head and the American Kennel Club standard calls for the top of the head to be parallel to the dogs muzzle. The ears are another lovely feature of the Labrador and they should be able to touch the eyes when they are pulled forward. The eyes are an important part of the American Kennel Club standard and in yellow and black labs the eyes must be brown with black rims whilst chocolate Labradors should be brown or hazel with brown rims. A Labs nose is always on the go sniffing out mischief and on yellow and black Labs the nose should be black whilst chocolate Labs will have a brown nose. A Labrador should have a strong, straight back that tapers down from the shoulders to the hindquarters. Importantly, some may say improbably given the size of a Lab, the dogs neck should not have loose or flappy skin. For this type of Labrador, the tail is an important feature and all Labs should have the distinctive otter type tail – thick at the end and covered with thick curly fur. In the front the Lab should be nicely proportioned in the hips and shoulders. The front legs must be straight with the elbows below the top of the shoulder. The paws should be large (no surprise there) and the toes should be nicely arched. The back of the dog must be muscular and well developed with the back legs mirroring the front. All bones must of course be strong and similar to the front legs the feet should be large with arched toes.